P. R. R. shops, Altoona, Pa. Boiler-shop. P. R. R. shops, Altoona, Pa. Wheel-foundry. P. R. R. car shops, Altoona. P. R. R. shops, Altoona Pa. Looking through the lathe department. P. R. R. shops’ Altoona, Pa. on turn-table, in western round-house. P. R. R. shops’ Altoona, Pa. interior of western round-house. P. R. R. shops’ Altoona, Pa. interior of locomotive black-smith shop. P. R. R. shops Altoona, Pa. Rear view of erecting shop, from crane. 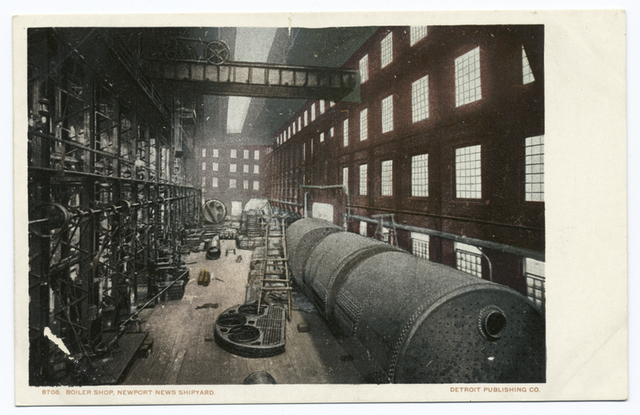 Interior of store-room, at P. R. R. shops, Altoona, Pa.
Boiler Shop, Shipyard, Newport News, Va.